Some secondary defenses require that the prey is able to detect the predator before the predator attacks. These defenses require that the insect have very sophisticated sensory systems to detect predators including sight, smell, hearing and touch. Vision is one of the most common ways that insects detect objects, including predators, in their environment. Insect vision is very complex (for more, see Insect Vision: The Compound Eye from this module), but it allows them to detect motion better than our vision! Probably the most obvious behavior that many potential insect prey have is to detect the predator and then run, jump, fly or swim away. Many insects use this kind of behavior, including cockroaches (ever tried to squash one?) and houseflies (ever tried to hit one with a fly swatter?). A cockroach has hairs on the filaments that project from its abdomen that can detect the change in air pressure that precedes a fast moving object (like the predator, your foot). The nerve impulses that trigger the evasive response by the legs can travel up to 3 meters per second and the response occurs in under 50 milliseconds. Check out the Insect Defenses site from North Carolina State University to compare your response time to the time it takes a cockroach to move away from your foot. Now you know why it is so hard to catch them! Figure 8.31: The large eyes of this dragonfly allow it to see potential predators and dart out of the way. 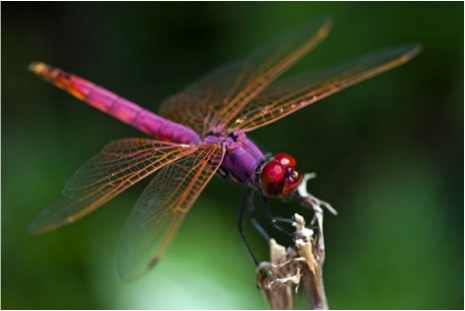 Adult dragonflies, often seen flying around ponds, are large, bright, and conspicuous insects— just the right set of characteristics to make a great, easy-to-catch lunch for birds. But dragonflies have large conspicuous eyes that allow them to see predators coming and dart out of the way. You can find this out first hand if you try to catch a dragonfly in a net. Every time you swing the net, it will dart out of the way! Some insects may flash a brightly colored body part, spray a foul-smelling chemical, or make a sound to startle a predator, giving themselves enough time to get away. For example, an adult female Mediterranean mantis, Iris oratoria, take on a pretty scary threat pose. 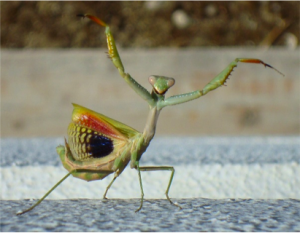 The mantis is typically fairly well camouflaged, but when disturbed it raises its front legs and opens its wings. Notice the pattern on the wing… what does this remind you of? A warning saying stay away from me! 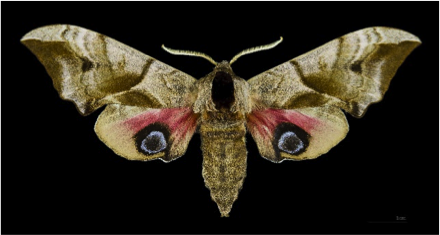 In another case, the eyed hawkmoth (Smerinthus ocellatus) is cryptic when at rest but when disturbed displays its large eyespots which it moves slowly as if it were a vertebrate predator such as an owl. Figure 8.34: The enlarged mouthparts of the stag beetle, Lucanus cervus, can be an effective morphological defense. Morphological defenses do not require that the prey detect the predator. They have evolved to be “on” all the time. A primary example is an insect’s hard exoskeleton, which serves as an effective defense against some predators. Many insects have spines, bristles, and hairs that may be effective mechanical deterrents against predators. A mouthful of hair or a poke from a spine can be an unpleasant experience for a predator. In some insects, body parts have been enlarged to serve as deterrents to predation. 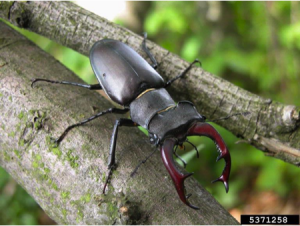 In the stag beetle, Lucanus cervus, the mouthparts are enlarged and can be effective in fighting off predators. Some aquatic juvenile caddisflies construct portable cases that are thought to deter predators. 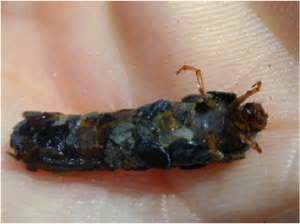 Figure 8.35: A caddisfly juvenile, shown upside-down on a hand. Note the case made out of pebbles and the head and legs that extend from the case. Another interesting defense is a leg that can break off easily if caught by a predator. Such insects have a “fracture line” where the leg breaks off. This phenomenon, called autotomy, is most common in walking sticks, grasshoppers, and other long-legged insects. In most cases, losing a limb creates only a minor disability and some insects may actually regenerate all or part of the missing limb. Warning coloration and morphology are often combined with chemical or other defenses and are aposematic signals, where a warning signal is associated with the noxiousness of a prey item to potential predators. Interestingly, warning coloration and morphology are just the opposite of being cryptic— here the potential prey actually “advertise” the warning signal. However, the warning “tells” the predator not to eat the potential prey because it is poisonous or noxious in some other way (a bee that stings, for example). There are cases where a potential prey is not noxious, but actually mimics one that is. We will explore this below. 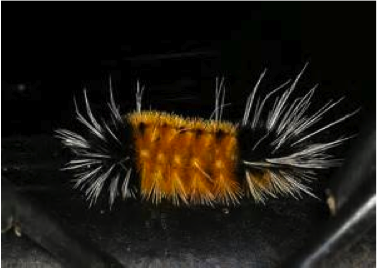 Figure 8.36: Caterpillar with warning coloration and spines and hairs. The warning signal, which is easily detected, is the primary defense, while the secondary defense is non-visible. Warning signals are primarily visual, using bright colors (red, yellow, black and white) and high-contrast patterns such as stripes. 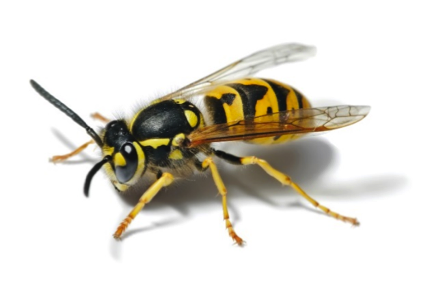 Most secondary defenses are chemical (e.g., moths that taste bad) or physical (e.g., bees that sting). The defense mechanism relies on the memory of the would-be predator; a bird that has once experienced a foul-tasting grasshopper will try to avoid a repetition of the experience. Aposematic signals are beneficial for both the predator and prey, both of which avoid potential harm by avoiding the predator attack. Figure 8.37: Caterpillar with warning coloration and spines and hairs. There are many examples of warning coloration. Some caterpillars, which are juveniles of moths and butterflies, have prickly spines and hairs often associated with warning coloration. Many bombardier beetles are brightly colored ground beetles that are most notable for the defense mechanism that gives them their name: when disturbed, they eject a hot noxious chemical spray from the tip of their abdomen, with a popping sound. 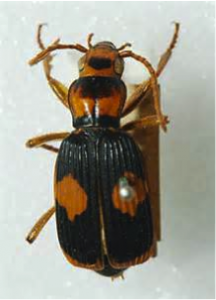 The spray is produced by a reaction between two chemical compounds stored in separate reservoirs in the beetle’s abdomen and mixed when needed in a third chamber with water and enzymes. 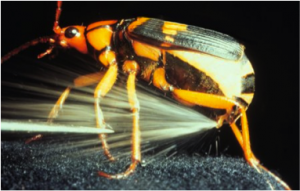 Heat from the reaction brings the mixture to near the boiling point of water and produces gas that drives the ejection of the gas/liquid through abdominal glands, which in some cases can swivel through 270° and thrust between the insect’s legs, discharging the fluid in a wide range of directions with considerable accuracy. The whole sequence of events takes only a fraction of a second. The damage caused can be fatal to attacking insects and small creatures and is painful to human skin. Figure 8.38: The bombardier beetle, Pheropsophus verticalis. 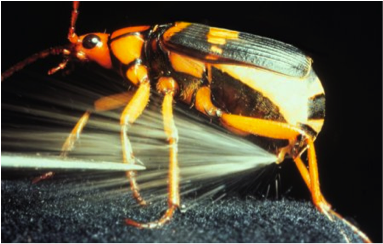 Figure 8.39: A bombardier beetle releasing a noxious chemical spray. Interestingly, insects that have warning signals do not necessarily possess chemical or physical defenses. They may just mimic an insect that does! 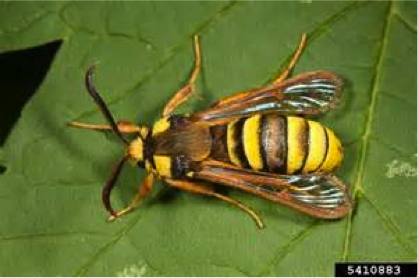 For example, the hornet moth is a mimic of the yellow jacket wasp; it resembles the wasp, but is not capable of stinging. A predator which would thus avoid the wasp would similarly avoid the moth. Figure 8.41: Yellow jacket wasp. 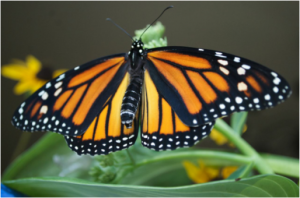 Another common mimic pair is the monarch and viceroy butterflies. 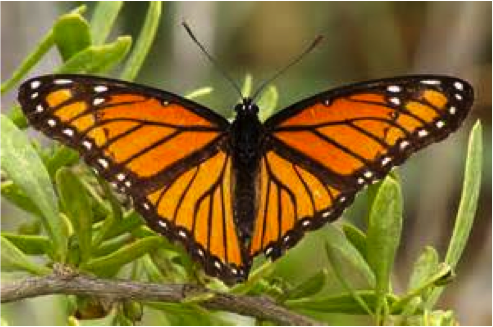 Monarchs are foul-tasting and poisonous due to the presence of chemicals in their bodies. The caterpillars ingest the chemicals, which act in heart-arresting ways similar to digitalis, as they feed on milkweed. The toxins are passed on to the butterfly after molting. The toxins are in the wings and bodies. Since many birds attack the wings of the butterfly, they are left with a very foul taste that may prevent them from ever ingesting other monarchs or the similar appearing viceroy.